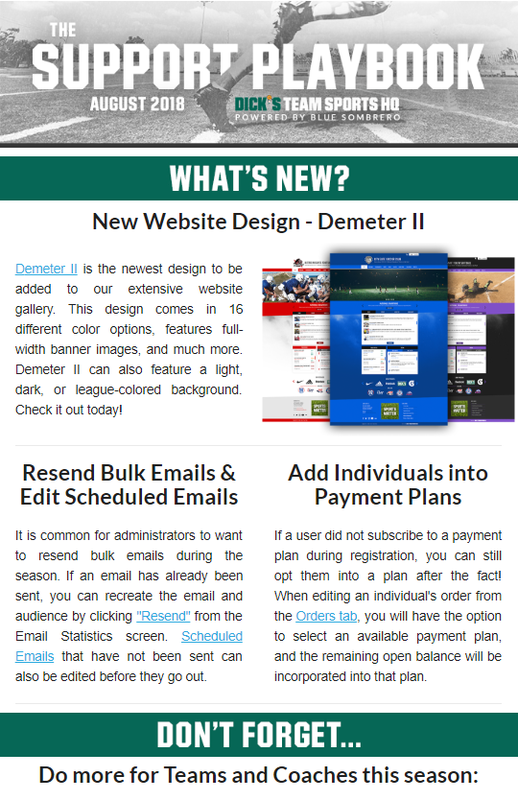 Demeter II is the newest website design in our robust website gallery. August also saw enhancements to our Bulk Email tool, with administrators now being able to resend past emails and edit scheduled emails. Orders has also been made easier with the ability to now add players into payment plans after registration. Don’t Forget, our system offers a lot of value for coaches and teams. Learn how to quickly and easily enable powerful tools for teams to use throughout the season. Did You Know?, additional fees can arise during the course of the season. If you need a way to send invoices to teams or groups of players after registration, Bulk Fees may be the perfect fit for you. Need help making your league more visible on search engines like Google? Don’t worry, in our Market Your League: 101 section, we cover some simple search engine optimization (SEO) tips that any administrator can implement, quickly and easily.